When I clicked on the metered paywall link, it took me to a plain old subscription page. So I thought, “Hey, since they have tracking cruft appended to that link, shouldn’t it take me to a page that says something like, “Hi, Doc! Thanks for clicking, but we know you’re already a paying subscriber, so don’t worry about the paywall”? 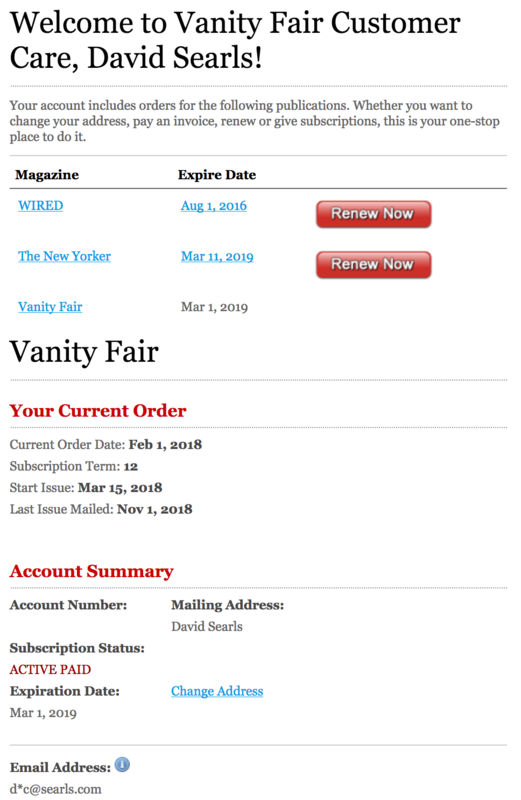 So I went to the Vanity Fair home page, found myself logged in there, and clicked on “My Account.” This took me to a page that said my email address was my primary one, and provided a way to change my password, to subscribe or unsubscribe to four newsletters, and a way to “Receive a weekly digest of stories featuring the players you care about the most.” The link below said “Start following people.” No way to check my account itself. So I logged out from the account page I reached through the Customer Care link, and logged in with my primary email address, again using my password manager. That got me to an account page with the same account information you see above. An error occurred while processing your request.An error occurred while processing your request. Please call our Customer Care Department at 1-800-667-0015 for immediate assistance or visit Vanity Fair Customer Care online. Invalid logging session ID (lsid) passed in on the URL. Unable to serve the servlet you’ve requested. So there ya go: one among .X zillion other examples of subscription hell, differing only in details. Fortunately, there is a better way. Read on. The only way to pave a path from subscription and customer service hell to the heaven we’ve never had is by normalizing the ways both work, across all of business. And we can only do this from the customer’s side. There is no other way. We need standard VRM tools to deal with the CRM and CX systems that exist on the providers’ side. We fixed networking, publishing and mailing online with the simple and open standards that gave us the Internet, the Web and email. All those standards were easy for everyone to work with, supported boundless economic and social benefits, and began with the assumption that individuals are full-privilege agents in the world. This will give each of us a single way to see and manage many subscriptions, see notifications of changes by providers, and make changes across the board with one move. VRM + CRM. The same goes for customer care service requests. These should be normalized the same way. 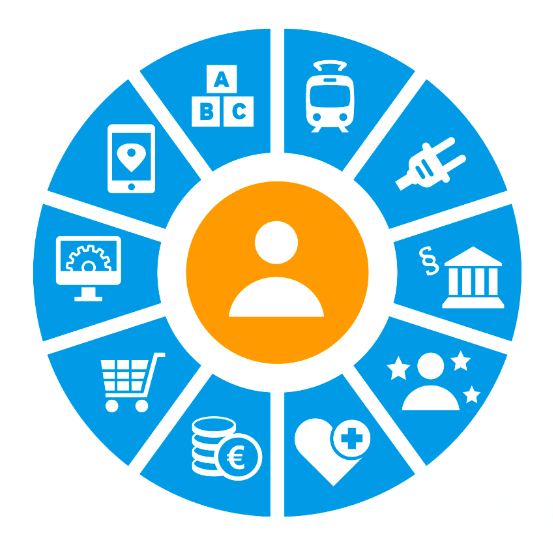 In the absence of normalizing how people manage subscription and customer care relationships, all the companies in the world with customers will have as many different ways of doing both as there are companies. And we’ll languish in the login/password hell we’re in now. The VRM+CRM cost savings to those companies will also be enormous. For a sense of that, just multiply what I went through above by as many people there are in the world with subscriptions, and multiply that result by the number of subscriptions those people have — and then do the same for customer service. We can’t fix this inside the separate CRM systems of the world. There are too many of them, competing in too many silo’d ways to provide similar services that work differently for every customer, even when they use the same back-ends from Oracle, Salesforce, SugarCRM or whomever. Fortunately, CRM systems are programmable. So I challenge everybody who will be at Salesforce’s Dreamforce conference next week to think about how much easier it will be when individual customers’ VRM meets Salesforce B2B customers’ CRM. I know a number of VRM people who will be there, including Iain Henderson, of the bonus link below. Let me know you’re interested and I’ll make the connection. And come work with us on standards. Here’s one. 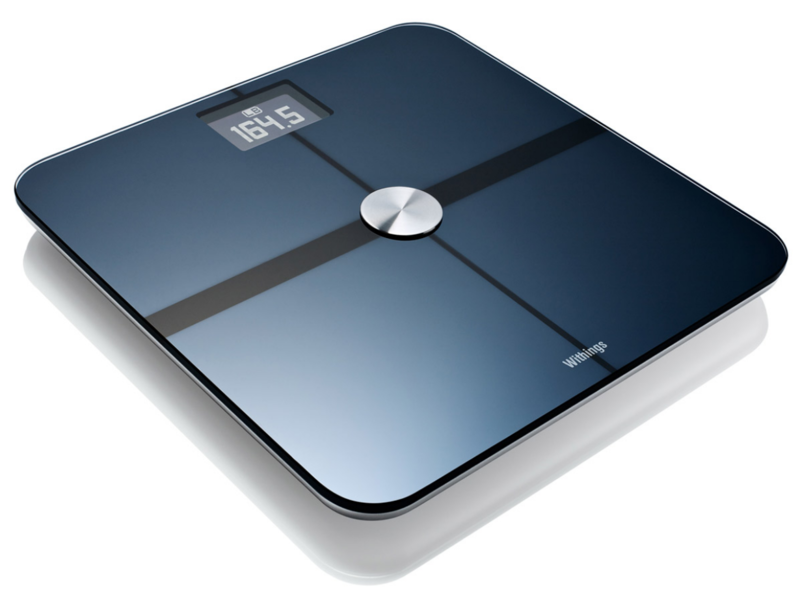 A few years ago I got a Withings bathroom scale: one that knows it’s me, records my weight, body mass index and fat percentage on a graph informed over wi-fi. The graph was in a Withings cloud. I got it because I liked the product (still do, even though it now just tells me my weight and BMI), and because I trusted Withings, a French company subject to French privacy law, meaning it would store my data in a safe place accessible only to me, and not look inside. Or so I thought. Here’s the announcement at the “learn more” link. Sounded encouraging. 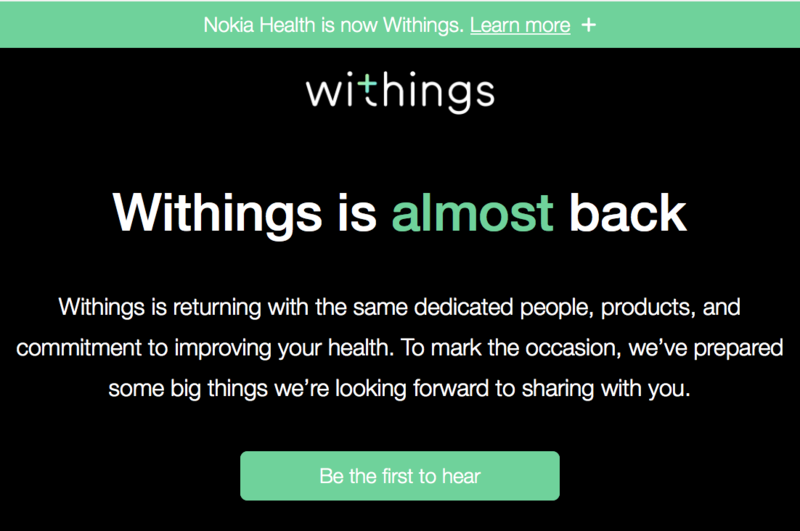 So I dug a bit and and saw that Nokia in May planned to sell its Health division to Withings co-founder Éric Carreel (@ecaeca). 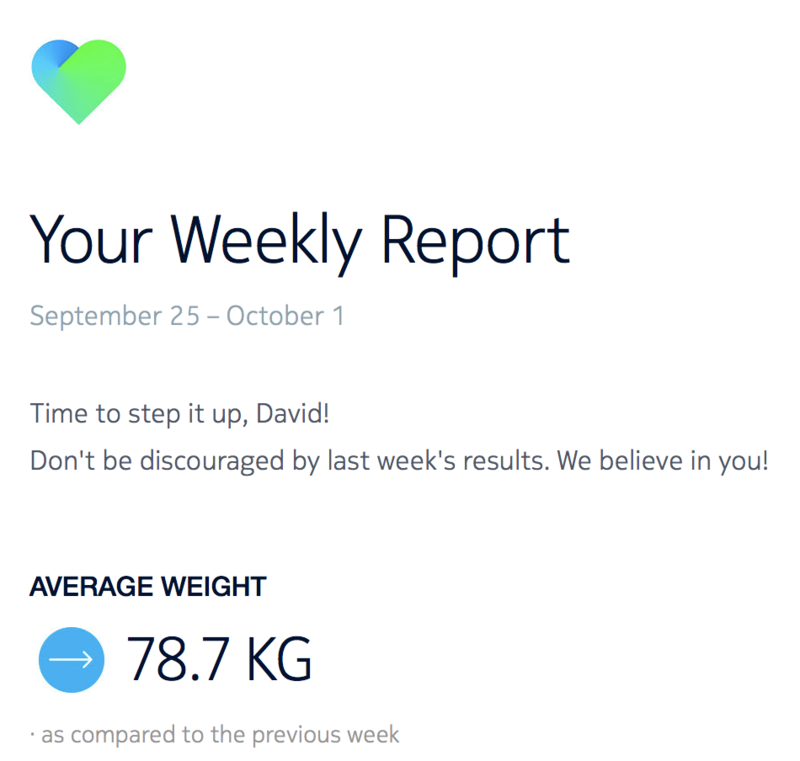 One big reason I bought my Withings scale was to monitor my own weight, by myself. As I recall the promise from Withings was that my data would remain known only to me (though Withings would store it). Since then I have received many robotic emailings telling me my weight and offering encouragements. This annoys me, and I would like my data to be exclusively my own again — and for that to be among Withings’ enticements to buy the company’s products. Thank you. Thank you for contacting Nokia Customer Support about monitoring your own weight. I’ll be glad to help. Obviously, the person there didn’t understand what I said. So I’m saying it here. And on Twitter. What I’m hoping isn’t for Withings to make a minor correction for one customer, but rather that Éric & Withings enter a dialog with the @VRM community and @CustomerCommons about a different approach to #GDPR compliance: one at the end of which Withings might pioneer agreeing to customers’ friendly terms and conditions, such as those starting to appear at Customer Commons. That’s Sean Bohan, head of our steering committee, expanding on what many people at the conference already knew. It was an entirely new talk. Pretty good one too, especially since I came up with it the night before. See, by the end of Day 1, it was clear that pretty much everybody at the conference already knew how market power was shifting from centralized industries to distributed individuals and groups (including many inside centralized industries). It was also clear that most of the hundreds of people at the conference were also familiar with VRM as a market category. I didn’t need to talk about that stuff any more. At least not in Europe, where most of the VRM action is. So, after a very long journey, we’re finally getting started. 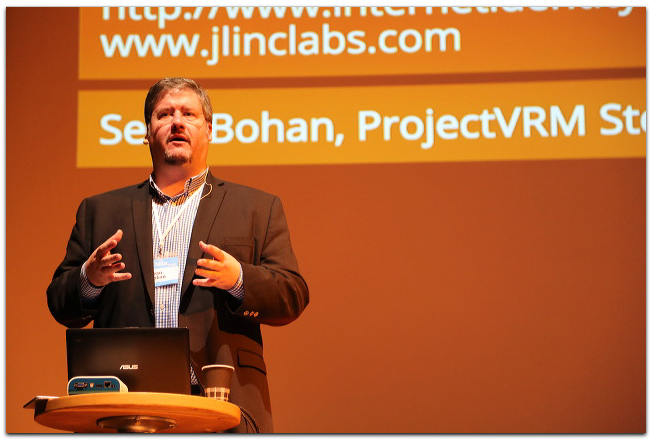 And then, one decade ago last month, I started ProjectVRM, because that clue wasn’t yet true. Our reach did not exceed the grasp of marketers in the world. If anything, the Net extended marketers’ grasp a lot more than it did ours. (Shoshana Zuboff says their grasp has metastacized into surveillance capitalism. ) In respect to Gibson’s Law, Cluetrain proclaimed an arrived future that was not yet distributed. Our job was to distribute it. Which we have. And we can start to see results such as those above. So let’s call Phase One a done thing. And start thinking about Phase Two, whatever it will be. To get that work rolling, here are a few summary facts about ProjectVRM and related efforts. A wiki with a lot of stuff in it, including concepts that are now starting to play out in different ways. In addition to VRM itself, these include intentcasting, EmanciPay and the r-button. Second, we have a spin-off: Customer Commons, which will do for personal terms of engagement (one each of us can assert online) what Creative Commons (another Berkman-Klein spinoff) did for copyright. Privacy. The concept is much more highly sensitive and evolved in Europe than in the U.S. The reason we most often get goes, “Some of our governments once kept detailed records of people, and those records were used to track down and kill many of them.” There are also more evolved laws respecting privacy. In Australia there have been privacy laws for several years requiring those collecting data about individuals to make it available to them, in forms the individual specifies. And in Europe there is the General Data Protection Regulation, which will impose severe penalties for unwelcome data gathering from individuals, starting in 2018. What we lack is research. And by we I mean the world, and not just ProjectVRM. Research is normally the first duty of a project at the Berkman Klein Center, which is chartered as a research organization. Research was ProjectVRM’s last duty, however, because we had nothing to research at first. Or, frankly, until now. That’s why we were defined as a development & research project rather than the reverse. Where and how research on VRM and related efforts happens is a wide open question. What matters is that it needs to be done, starting soon, while the “before” state still prevails in most of the world, and the future is still on its way in delivery trucks. Who does that research matters far less than the research itself. So we are poised at a transitional point now. Let the conversations about Phase Two commence. This is a shopping vs. advertising story that starts with the JBP Flip 2 portable speaker I bought last year, when Radio Shack was going bankrupt and unloading gear in “Everything Must Go!” sales. I got it half-off for $50, choosing it over competing units on the same half-bare shelves, mostly because of the JBL name, which I’ve respected for decades. Before that I’d never even listened to one. The battery life wasn’t great, but the sound it produced was much better than anything my laptop, phone or tablet put out. It was also small, about the size of a beer can, so I could easily take it with me on the road. Which I did. A lot. Alas, like too many other small devices, the Flip 2’s power jack was USB micro-b. That’s the tiny flat one that all but requires a magnifying glass to see which side is up, and tends to damage the socket if you don’t slip it in exactly right, or if you force it somehow. While micro-b jacks are all design-flawed that way, the one in my Flip 2 was so awful that it took great concentration to make sure the plug jacked in without buggering the socket. Which happened anyway. One day, at an AirBnB in Maine, the Flip 2’s USB socket finally failed. The charger cable would fit into the socket, but the socket was loose, and the speaker wouldn’t take a charge. After efforts at resuscitation failed, I declared the Flip 2 dead. But I was still open to buying another one. So, to replace it, I did what most of us do: I went to Amazon. Naturally, there were plenty of choices, including JBL Flip 2s and newer Flip 3s, at attractive prices. But Consumer Reports told me the best of the bunch was the Bose Soundlink Color, for $116. So I bought a white Bose, because my wife liked that better than the red JBL. The Bose filled Consumer Reports’ promise. While it isn’t stereo, it sounds much better than the JBL (voice quality and bass notes are remarkable). It’s also about the same size (though with a boxy rather than a cylindrical shape), has better battery life, and a better user interface. I hate that it charges through a micro-b jack, but at least this one is easier to plug and unplug than the Flip 2 had been. So that story had a happy beginning, at least for me and Bose. It was not happy, however, for me and Amazon. 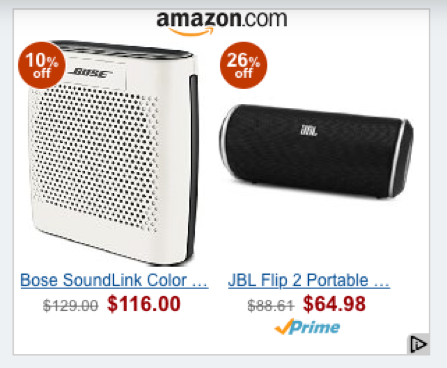 I lost count of how many times, and in how many places, I saw this Amazon ad, or one like it, for one speaker, the other, or both, after I finished shopping and put the Bose speaker in my cart. Why would Amazon advertise something at me that I’ve already bought, along with a competing product I obviously chose not to buy? Why would Amazon think it’s okay to follow me around when I’m not in their store? And why would they think that kind of harassment is required, or even okay, especially when the target has been a devoted customer for more than two decades, and sure to return and buy all kinds of stuff anyway? Jeez, they have my business! And why would they go out of their way to appear both stupid and robotic? The answers, whatever they are, are sure to be both fully rationalized and psychotic, meaning disconnected from reality, which is the marketplace where real customers live, and get pissed off. And Amazon is hardly alone at this. In fact the practice is so common that it became an Onion story in October 2018: Woman Stalked Across 8 Websites By Obsessed Shoe Advertisement. The ad industry’s calls this kind of stalking “retargeting,” and it is the most obvious evidence that we are being tracked on the Net. The manners behind this are completely at odds with those in the physical world, where no store would place a tracking beacon on your body and use it to follow you everywhere you go after you leave. But doing exactly that is pro forma for marketing in the digital world. 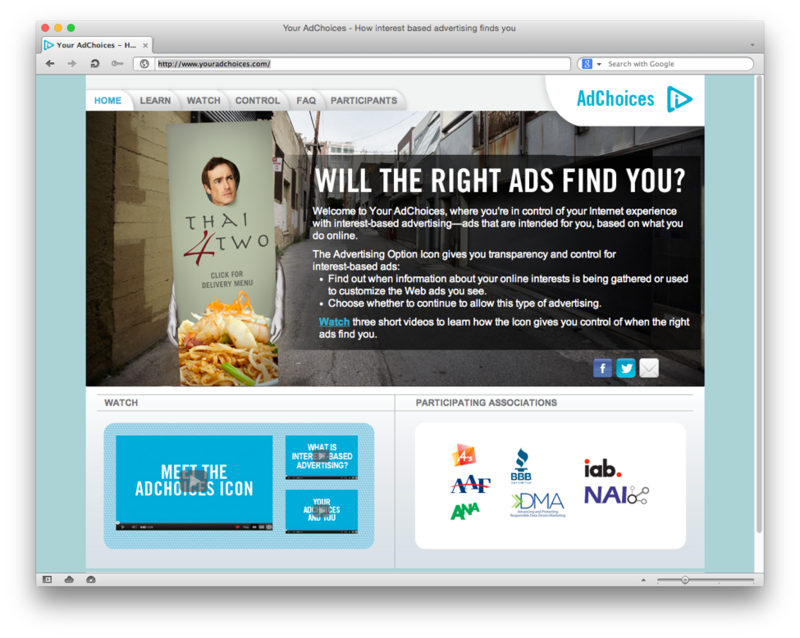 That Ad Choices is “yours.” It’s not. It’s theirs. That “right ads” exist, and that we want them to find us, at all times. That making the choices they provide actually gives us control of advertising online. That our personal agency—the power to act with full effect in the world—is a grace of marketers, and not of our own independent selves. Not long after I did that little bit of shopping on Amazon, I also did a friend the favor of looking for clothes washers, since the one in her basement crapped out and she’s one of those few people who don’t use the Internet and never will. Again I consulted Consumer Reports, which recommended a certain LG washer in my friend’s price range. I looked for it on the Web and found the best price was at Home Depot. So I told her about it, and that was that. 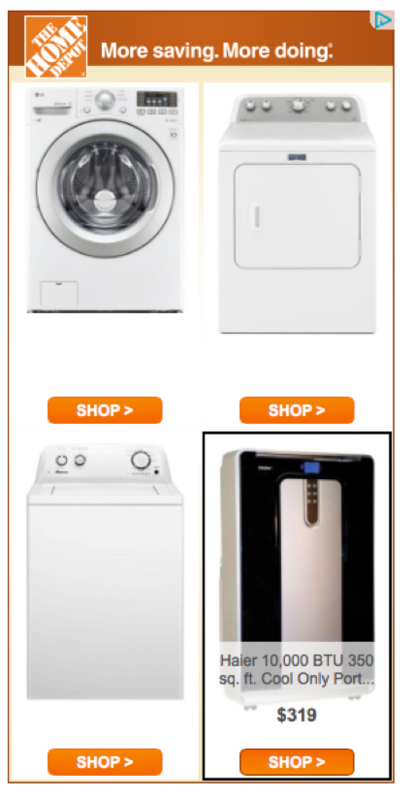 Needless to say, this didn’t endear me to Home Depot, to LG, or to any of the sites where I got hit with these ads. All these parties failed not only in their mission to sell me something, but to enhance their own brands. Instead they subtracted value for everybody in the supply chain of unwelcome tracking and unwanted message targeting. They also explain (as Don Marti does here) why ad blocking has grown exactly in pace with growth in retargeting. I subjected myself to all this by experimentally turning off tracking protection and ad blockers on one of my browsers, so I could see how the commercial Web works for the shrinking percentage of people who don’t protect themselves from this kind of abuse. I do a lot of that, as part of my work with ProjectVRM. I also experiment a lot with different kinds of tracking protection and ad blocking, because the developers of those tools are encouraged by that same work here. For those new to the project, VRM stands for Vendor Relationship Management, the customer-side counterpart of Customer Relationship Management, the many-$billion business by which companies manage their dealings with customers—or try to. 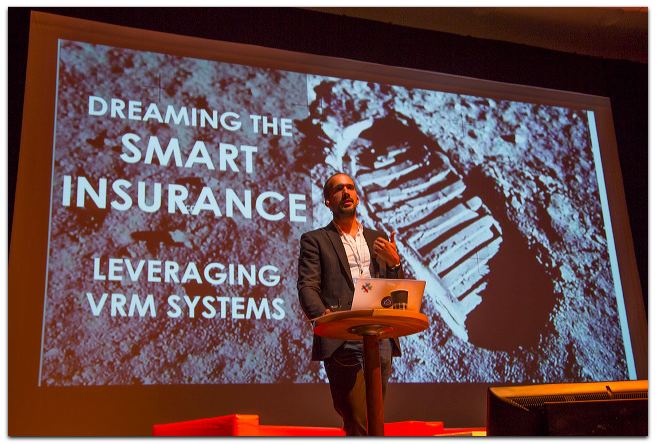 Our purpose with ProjectVRM is to encourage development of tools that give us both independence from the companies we engage with, and better ways of engaging than CRM alone provides: ways of engaging that we own, and are under our control. And relate to the CRM systems of the world as well. Our goal is VRM+CRM, not VRM vs. CRM. Ad blocking and tracking protection are today at the leading edge of VRM development, because they are popular and give us independence. Engagement, however, isn’t here yet—at least not at the same level of popularity. And it probably won’t get here until we finish curing business of the brain cancer that adtech has become. [Later…] After reading this, a friend familiar with the adtech business told me he was sure Bose’s and JPL’s agencies paid Amazon’s system for showing ads to “qualified leads,” and that Amazon’s system preferred to call me a qualified lead rather than a customer whose purchase of a Bose speaker (from Amazon!) mattered less than the fact that its advertising system could now call me a qualified lead. In other words, Amazon was, in a way, screwing Bose and JPL. If anyone has hard facts about this, please send them along. Until then I’ll consider this worth sharing but still unproven. Privacy isn’t about secrecy and freedom isn’t about license. Both are about agency. The condition of being in action; operation. The means or mode of acting; instrumentality. It is derived from agere: Latin for to do. We are built to do a lot: with our brains, our opposable thumbs, our lack of fur, our capacity to sweat and to learn — and our strange ability to walk or run on two feet instead of four (almost ceaselessly, at least when we are young and fit) — we can do an amazing variety of things with our bodies. For what we can’t do, we invent tools and machines. These extend our agency outward through technology. A hammer becomes another length of arm. With one in our hand, we have the power to drive nails with a metal fist. A car gives us an engine and wheels, so we can zoom down roads at dozens of miles (or kilometers) per hour. A plane gives us engines and wings, so we can fly far and high. Each expands our agency to distant horizons of effect and experience in the world. Infrastructure and services expand what each and all of us can do as well. But at the base of human capacity is the individual’s ability to do stuff in the world. Or, in a word, agency. 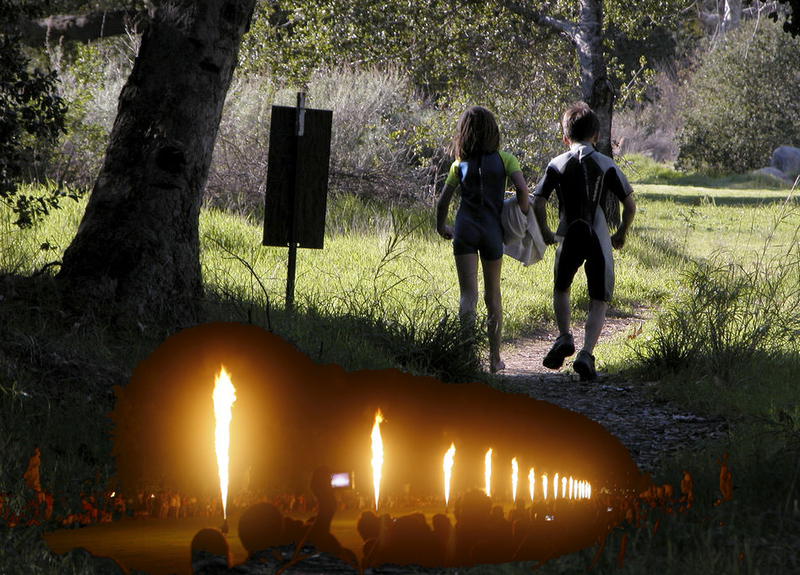 Which brings me to the second world we built alongside the physical one we all share. That second world is the Internet: a Giant Zero shaped by an oddly simple protocol: TCP/IP. Never mind how it works. Just note what it does: reduce to zero the functional distance between everything and everybody on it. Also the cost. As a way to expand human agency, the Internet has no rivals. It gives all our voices, all our ideas, all our actions, worldwide scale. Any of us can speak, write, publish and much more, across any distance, at levels of inconvenience and cost that veer toward zero. And that became the Net’s basic design. Or at least its ideal. Yet, for the sake of convenience — especially in the early days of the Net, when most of us were still on dial-up — we defaulted to a client-server architecture for deploying servers and services. With client-server, each server is a central point, which makes the Net, in a practical sense, a decentralized thing, rather than a distributed one. And yet the distributed nature of the Net persists, grounding our agency in the world it defines. Conflicts between centralized, decentralized and distributed capacities on the Net — and uneven development of tools and services enlarging our agency — are behind many of our crises on the Net today. Take privacy for example. It’s a huge issue. Survey after survey (e.g. from Pew, TRUSTe and Customer Commons) say that 90% and more of us are concerned about personal privacy on the Net, don’t trust many service providers, or lie and hide to obscure personal identity. Advertising and tracking blockers are the most popular browser extensions, and with good reason: we are still naked on the Net. That’s because the Net, like nature in the physical world, doesn’t come with privacy installed. We have to make it for ourselves. In the physical world we did it by inventing clothing and shelter. In the virtual world we still don’t have either. Tracking blockers are fig leaves at best. They also all work differently. We are still in early times. Since we have no privacy yet (other than by staying off the Net, or by isolating ourselves on it by declining to accept cookies and staying away from services such as Google’s and Facebook’s), we tend to think about privacy in terms of secrets: things we don’t want others to know about us. But think instead about what we do to create privacy in the physical world, with clothing and shelter. Both do more than cover our bodies and and our lives. We express both. We also express with them. Our clothing and shelter send signals about ourselves. They speak of our tastes, our gender, our status, our memberships. Most of these speakings are subtle, but many are not. What matters is that they all valve our exposure to others. Buttons and zippers on our clothes speak of what can, can’t and shouldn’t be opened by others, without permission. Doors, shades and shutters on our homes do the same. All of those things facilitate our agency. We need the same in the networked world. The main difference is that we’ve had thousands of years to work them out in the physical world, and just twenty in the networked one. In the history of civilization, and even of business, this is close to nothing. We’re barely started. 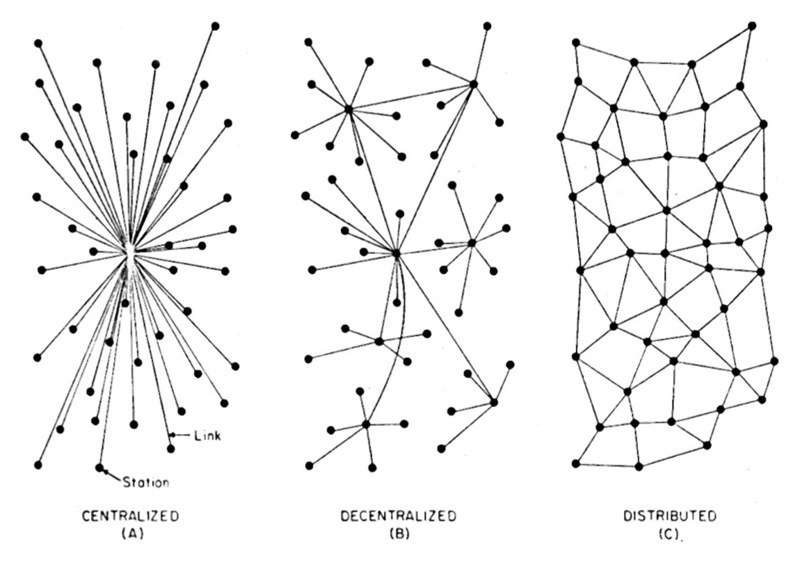 There will, inevitably, emerge a symbiosis between centralized, decentralized and distributed capacities. Brian Behlendorf uses the term “minimum viable centralization” to label what we’re looking for here. 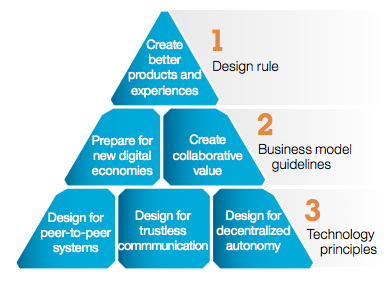 Meanwhile we have maximum viable centralization on a network that is also distributed by design. Just like the humans on it. We are seeing today a collapse of intermediary institutions. Publishing (e.g. blogs) Hospitality (e.g. Airbnb), dispatch (e.g. Uber), broadcast (e.g. Meerkat and Periscope) and payments (e.g. Bitcoin) come quickly to mind, and many more are coming along. Yet through all of those there must remain some degree of trust in the graces that institutions — governments and companies — alone can provide. How can their minimum viable agencies help us enlarge our own? That’s the main challenge for the coming years. The question we need to ask, as we address that challenge through VRM, is this: What is best done by the individual, and what is best done by the institution — and how an the two work together? To answer that, agency must be key. Without it we’ll only get more centralized BS to distrust. Sydney — Australia’s privacy principles are among the few in the world that require organizations to give individuals personal information gathered about them. * This opens the path to proving that we can do more with our own data than anybody else can. Bravo to Ben — not just for whupping a giant, but for showing a path forward for individual empowerment in the marketplace. Thanks to Australia’s privacy principles, and Ben’s illustrative case, the yellow brick road to the VRM future is widest in Oz. Here (and in New Zealand) we not only have lots of VRM developers (Flamingo, Fourth Party, Geddup, Meeco, MyWave, OneExus, Welcomer and others I’ll insulting by not listing yet), but legal easement toward proving that individuals can do the more with their own data than can the companies that follow us. And proving as well that individuals managing their own data will be good for those companies as well. 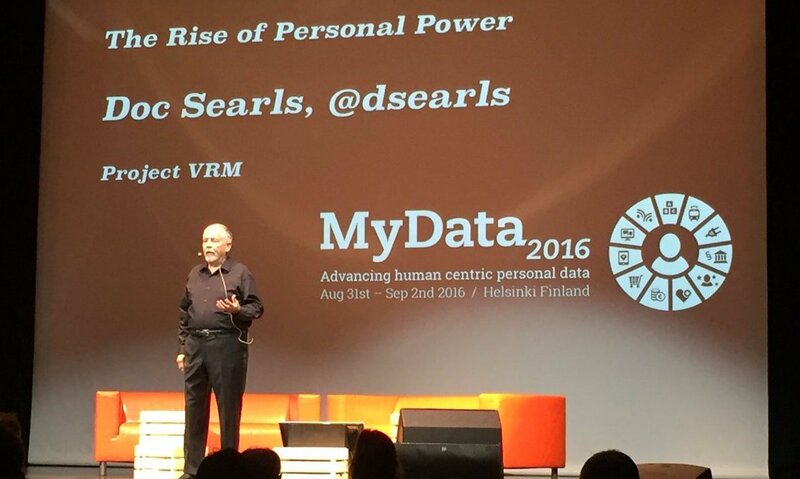 The data they get will be richer, more accurate, more contextual, and more useful. There should be symbiosis here. There are things big organizations do best, and things individuals do best. And much that both do best when they work together. Look at cars, which are a VRM technology: we use them to get around the marketplace, and to help us do business with many companies. They give us ways to be both independent and engaging. But companies don’t drive them. We do. Companies provide parking lots, garages, drive-up windows and other conveniences for drivers. Symbiosis. So, while Telstra is great at building and managing communication infrastructure and services, its customers will be great at doing useful stuff with the kind of data Ben requested, such as locations, calls and texts — especially after customers get easy-to-use tools and services that help them work as points of integration for their own data, and managers of what gets done with it. There are many VRM developers working toward that purpose, around the world, And many more that will come once they smell the opportunities. These opportunities are only apparent when you look at the market through your own eyes as a sovereign human being. The same opportunities are mostly invisible when you look at the market from the eye at the top of the industrial pyramid. Hugh McLeod, who drew the cartoon at the top for me way back in 2004. * My understanding is that privacy principles such as the OECD’s and Ontario’s provide guidance but not the full force of law, or means of enforcement. Australia’s differ because they have teeth. See the Determination on page 36 of the Privacy Commissioner’s investigation and decision. Canada’s also has teeth. See the list of orders issued in Ontario. If there are other examples of decisions like this one, anywhere in the world, please let us know. Look in the direction that Meerkat and Periscope both point. Stereo sound is coming. So is binaural sound, with its you-are-there qualities. 3D will come too, of course, especially as mobile devices start to include two microphones and two cameras. The end state of both those developments is VR, or virtual reality. At least on the receiving end. The production end is a different animal. Or herd of animals, eventually. Expect professional gear from all the usual sources, showing up at CES starting next year and on store shelves shortly thereafter. Walking around like a dork holding a mobile in front of you will look in 2018 like holding a dial-phone handset to your head looks today. Now pause to dig @ctrlzee‘s Fast Company report on Facebook’s 10-year plan to trap us inside The Matrix. How long before Facebook buys Meerkat and builds it into Occulus Rift? Or buys Twitter, just to get Periscope and do the same? We should start zero-basing the answers today, while the inevitable is in sight but isn’t here yet. Empathy is the first requirement. (Take the time to dig Dave Winer’s 12-minute podcast on the topic. It matters.) Getting permission is another. As for the relevance of standing law, almost none of it applies at the technical level. Simply put, all copyright laws were created in times when digital life was unimaginable (e.g. Stature of Anne, ASCAP), barely known (Act of 1976), or highly feared (WIPO, CTEA, DMCA). We’ve only been living the networked life since graphical browsers and ISPs arrived in the mid-90’s. Meanwhile we’ve had thousands of years to develop civilization in the physical world. Which means that, relatively speaking, networked life is Eden. It’s brand new here, and we’re all naked. That’s why it’s so easy anybody to see everything about us online. Manners come first, and we barely have those yet, if at all. None of the big companies that currently dominate our digital lives have fully thought out how to protect anybody’s privacy. Those that come closest are ones we pay directly, and are financially accountable to us. We’ll be talking about this, and many other things, at VRM Day (6 April) and IIW (7-9 April) in the Computer History Museum in downtown Silicon Valley (101 & Shoreline, Mountain View). 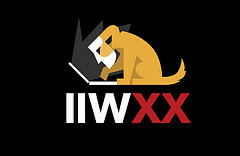 A veteran VRooMer tells me a design fiction would be a fun challenge for VRM Day and IIW (which will run from April 6-9 at the Computer History Museum in Mountain View, CA). Coincidentally, the subject of VRM Day (and a focus for the three days that will follow at IIW) is a maturity model framework that will provide every VRM developer the same single sheet (or set of them) on which to show where they stand in developing VRM capabilities into their company, product, code base or whatever else they’re working on. Work has already started on it, and those doing the work will present a first draft of it on VRM Day. You know the old saying, “all singing from the same song sheet”? The VRM maturity model framework is it. Think of it as a musical score that is starting to be written, for an orchestra will come together. When we’re done with this round, we’ll at least know what the score describes, and give the players of different instruments enough of a framework so they know where they, and everybody else, fits. Provide analysts with a single framework for understanding all VRM developers and development, and the coherencies among them. Give VRM developers a way to see how their work complements and/or competes with other VRM work that’s going on — and guide future developments. Give each developer a document to use for their own internal and external purposes. Give CRM, CE. CX and other vendor-side systems a clear picture of what pieces in the VRM development community will connect with their systems, and how, so buyer-side and seller-side systems can finally connect and grow together. While we do this, it might also be fun to work out a design fiction as a summary document or video. What would the complete VRM solution (which will surely be a collection of them) look like? How would we present it as a single thing? All of this is food for thinking and re-thinking. Suggestions invited.